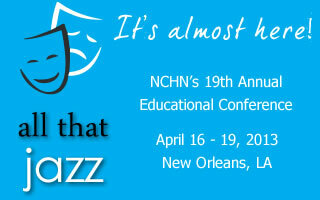 The NCHN Conference is only a month and a half away. Make sure you register before April 1st to get $75 off of on registration. Also, please make sure you have made your hotel reservations as rooms have nearly sold out. This year's Pre-Conference Workshop, Got Outcomes? What's Your Evidence, still has spaces open. Find out more about this session here. 2013 Award Nominations are being accepted and are due by March 15th. Find out more here. It seems the way most of us use the phrase “I’m sorry” is a bit like the childhood story, The Three Bears: too much, too little, or just about right. It is worth the effort to get it right. People perceive a lot about our self confidence and integrity when we do - or do not - apologize and mean it. Toniann Richard is the Executive Director of HCC of Rural Missouri and recipient of the 2012 NCHN New and Emerging Network Leader of the Year. There is now widespread agreement that our declining health status is an issue we can no longer ignore or defer. And most of us are beginning to understand that it’s an issue in which we all have a very big stake. Jay Seifer is co-founder of LoneStart Wellness. He will be a monthly wellness guest columnist for the NCHN e-News and blog. Act now to nominate your favorite health network leader and/or organization so that that they might be known and honored nationally for dedicating their professional life, expertise, time and talent to providing and improving the health services of their network members. Entry deadline is March 15, 2013. We have once again redesigned the e-News (if you did not notice). We did this to make the news more scannable and readable. We want to include much more member news and ensure that the NCHN e-News is one that you find easy to read and that you actually want to open. We plan to include a Member Feature in every issue, so don't be surprised if we come knocking at your inbox asking you to share information about your projects. Time and time again we hear that the most useful information we include in the newsletter is about (surprise) other members. So please touch base with us if you are ready to share some exciting news about your network. We are also happy to announce that, as part of the redesign, Jay Seifert will be providing a monthly column about wellness. He is an expert on such things and, in addition to being a guest columnist and guest blogger, he'll be presenting Wellness? That is so 2012! Reframing our Conversation about Well-Being for 2013 & Beyond, at the Conference Friday morning. RWHC: Eye on Health (March 2013): "Federal Policy Undermines Rural Health"
RWHC is co-sponsoring a series entitled "Hospital Best Practice Events"
The purpose of this program is to support formal rural health networks that focus on activities relating to the recruitment, education, training, and retention of HIT specialists.